Adachi Museum of Art in Yasugi City, Shimane Prefecture features many pieces of Japanese modern art. Read on to find out what is not to be missed! The museum was founded by Zenko Adachi who grew up in Yasugi City. Adachi Museum of Art is famous for having Japan’s largest collection of Taikan Yokoyama’s paintings. The masterpieces of other modern Japanese painters are displayed as well. Not only paintings, but also an outstanding collection of ceramic art is exhibited. The museum is also famous for its beautiful Japanese garden. The vast garden covers approximately 165,000 square meters. It consists of many different styles: Karesansui (Dry Landscape Garden, also known as Rock Garden in English), White Gravel and Pine Garden, Moss Garden, Pond Garden, etc. This extraordinary Japanese garden was based on the founder’s philosophy that “Japanese garden is also a picture”. Popular French travel guidebooks such as the Michelin Green Guide Japan and the Guide Bleu Japon rated the garden three stars. The garden displays breathtaking seasonal sceneries. There are two cafes in Adachi Museum of Art that offer snacks and drinks. At Café Midori, you can enjoy sipping tasty coffee or green tea latte while observing the beautiful garden. 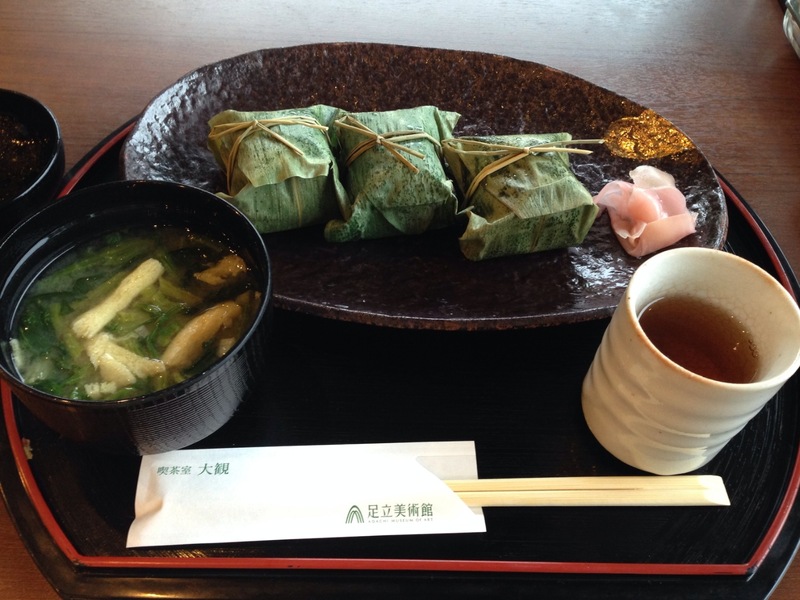 Café Taikan, surrounded by the Pond Garden, serves delicious cakes and specialty dishes such as curry and okowa (steamed sticky rice wrapped in bamboo leaves) using Shimane beef. Relaxing at the café with great food and spectacular views will make your trip memorable. Why don’t you plan your visit to Adachi Museum of Art to view the great museum collection and one of the nation’s best Japanese gardens?